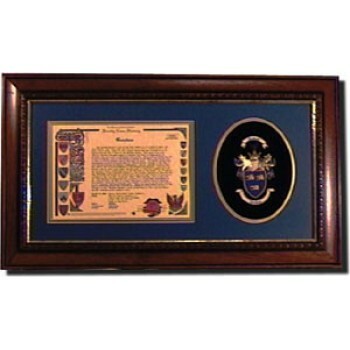 Our top of the range combined family history and embroidered Coat of Arms collection. A decorative parchment document describing how individual surnames developed from their early roots. From a society in which only first names were necessary you can discover how your surname came into being. The Coat of Arms is a freehand embroidery of the highest quality using silks and gold and silver threads in exacting detail. The overall effect is three dimensional with tasteful and delicate nuances. Set in a quality embossed frame and double matted with gold inner lining to enhance the detail of the gold and silver threads.